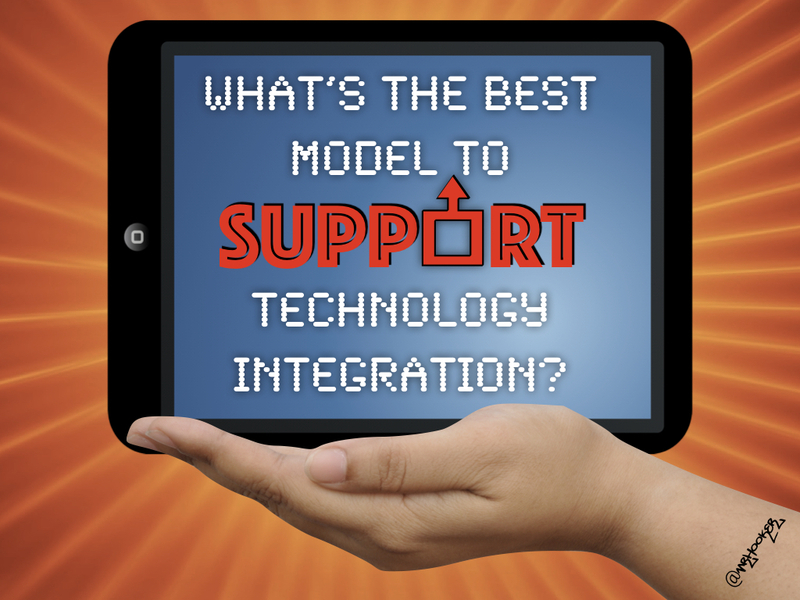 On a recent OnEducation Podcast episode (embedded at the bottom of this post), the hosts Mike and Glen got into a debate about what exactly is the “right” model of support when it comes to technology integration in schools? As they called out my name in particular, I felt it best to write this post in response. Make no bones about it…Technology is a gift with a tail. It’s predicted that schools will spend $19 Billion dollars on technology in schools. This can range from a variety of devices, apps, software and various “STEM” tools but not necessarily servers, wires, and all that stuff in the closet. Despite this large amount of money invested in technology, the amount of money to support and integrate these tools dwarfs the amount spent on the hardware and software. I’d also wager that a majority of that “support” money is primarily for personnel needed to repair and keep the technology running, not to integrate it into learning. I’ve been integrating technology in some form or fashion during my entire 20 years in education. A few years ago I wrote this post about how funding support in both I.T. and instruction can affect the level of integration. From that research as well as my work with districts around the country, I’ve seen a wide variety of models when it comes to support. With most models, the two largest determining factors are budget and vision. What follows are the various models I’ve seen employed by districts around the country. Each model is followed by a letter grade that is completely subjective, because, hey, this is for education right? In this model, staff and funding for support go solely towards keeping everything up and running. That means at a bare minimum, the technology will work. Will it be integrated thoughtfully? That depends largely on the teacher and the goals and expectation of the principal. I would say a majority of districts and schools across the country use this model. While it’s great that the technology can turn on and off, there’s really no way to know if it’s making a difference educationally without some intense expectations, strategies and vision from leadership. No tech support. No Instructional support. Just spend the money on devices and see what happens. Whenever you read research about how technology in schools doesn’t really help, it largely comes from schools that employ either the previous model or this one. Often times you’ll hear phrases like “well, some tech is better than no tech” but in terms of this model, you could almost make the case that this could be worse for students (not to mention the tax payers funding the bill). No support at all is not an advisable model. When I started as a classroom teacher, this was the widely used model I saw for technology integration. The way it works is you have I.T. staff to make sure the technology is running and you add some stipend or an extra amount to a group of teachers or a single “rock star” teacher to help with the integration on campus. While the district saves money by not paying for a full-time staff member to support integration, this model puts a lot of pressure on the Vanguard Teacher to not only do their full-time teaching duties, but also support staff on a variety of issues. As someone who lived this role for several years, eventually the vanguard teacher also gets roped into helping with printer issues, projector issues, and everything in between. This model seems to be on the rise as many districts that can’t support a full-time staff member. Having a consultant who’s an expert in technology integration can help build vision, support the Vanguard Teachers and converse with IT staff can be a huge benefit at a fraction of the cost of a full-time administrator. This model works best when school and district leadership are on board and match the vision for technology integration with campus-wide expectations. Also, having those Vanguard Teachers or to work with gives insight and boots on the ground so to speak. As someone who consults with schools and districts from time-to-time, I’ve seen first-hand the benefits of this model when done right. While far from ubiquitous, many districts districts land on this model of support by hiring a full-time administrator to help guide the integration of technology in schools. On top of helping with the vision and expectations, this person (also the role I’m currently in) works with all teachers, the community, leadership, and IT to makes sure all stakeholders are on the same page. While it does cost a district a little more, having a full time person coordinating the integration of technology came make a huge difference in learning and usage, especially when compared with the “Tech support only” models. The only reason this wouldn’t grade out higher depends on two factors – the amount of campuses to support and how they work with the I.T. Department. If an Instructional Technology Director has too many campuses to support, their impact is minimized as they can really only take a shotgun approach to integration. If they have an over-bearing or controlling IT department, it limits the amount of progress they can accomplish. This model involves putting a highly qualified, instructionally-focused staff member on each campus to support the integration of technology. Some schools have used current staff (instructional coaches or library media specialists) to sort of “hack” this model as it does cost the most money of all the models listed above. Others may not be able to have a person on each campus but have a centralized team. Both of those methods are helpful with integration and would grade out highly. However, having a dedicated ITS or EdTech on each campus to coach, co-teach, and lead innovation with technology on campuses can be EXTREMELY powerful. When coupled with well-communicated expectations from campus leadership and vision from the district, I’ve yet to ever see a more beneficial model of integrating technology into the classroom. Note: I may be a little biased as this is the model my district currently employs. That said, as someone who has been in the “Director” role for the past 8 years, I can tell you maintaining the A+ Coaching model isn’t necessarily easy. Whenever budget cuts come, as they often do in public education, it’s often the first position to come under the knife which can cause disruption and uncertainness to those in the position. Also, it’s important to coordinate these positions across the district to guarantee some level of fidelity or else risk the role being used differently from campus to campus. You can get various levels of technology integration depending on the vision, goals and budget of a district. I’ve lived through 3 different iterations of our “Ed Tech” position in my tenure and am now going through another “evolution” of sorts. As we’ve had a high level of support for years, we are evolving the position from someone who supports the integration of technology to someone who supports high quality teaching and learning with technology as an embedded part of that. While it seems subtle, it does change the ideology around support. Removing the word “technology” or “digital learning” from a title implies that this person supports all learning, which is a good thing. That also implies that they don’t exist solely to repair printer issues or help a principal make a newsletter. Regardless of roles, position titles, and support, without a well-communicated vision and expectation, technology usage will continue to be only substitutive in nature with the exception of a few outliers. If you have a moment, give the OnEducation Podcast below a listen. They start to get into the debate around the coaching and support models right around the 27 minute mark. Drop a comment below too if you have feedback on the models I’ve shared or maybe some I’ve left off. Interested in bringing me to your district? Reach out here.